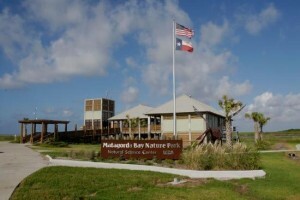 Matagorda Dunes is located on Matagorda Beach. The following activities are available at Matagorda Dunes or within just a few minutes of the property. The beach is one of the big draws for visitors to Matagorda. You can walk to the beach from the property or drive less than 2 minutes to the main beach entrance. You will need a beach vehicle permit to drive onto the beach. Beware the sand can be very soft. For more information visit the Matagorda Beach Information Page. Birders know Matagorda is one of the best places in the country to view birds. The Dunes is bordered by the beach on one side and wildlife preserve on the other sides. You never what you will see right here on the property. Birds are here all year round, but in the winter our Lagoon hosts lots of Red Head Ducks, Ibis, Blue Herons, Great Egrets and more. We are the only property on Matagorda Beach with a pool. When the beach gets too crowded for you or too rough to swim in the surf then it is time to enjoy the private pool at the Dunes. Matagorda has some of the best paddling access in the state. You can paddle right here on the lagoon without leaving the property or hit any of the public access sites in the area. In fact, our lagoon is probably the best place in Matagorda for beginners to try stand up paddle boarding since there is no boat traffic or current and the water is deep. Contact Matagorda Adventure Company to have a kayak or SUP delivered to your unit for an afternoon or multiple days. Beach Yoga classes are offered weekly just down the road at Jetty Park. If you are looking for something more personalized then book a private yoga class on your deck, the lawn next to the lagoon or next to the pool. Contact Matagorda Adventure Company for more information on yoga classes. There is horseback riding on Matagorda Beach! Just down the road T&D offers guided rides on the beach starting at Jetty Park. Contact T&D Adventure Park for more information. While no hunting is allowed on the property, we have world class hunting right out our back door. You can duck hunt in the marshes behind or the beach or book a hunt with one of the local guides. Matagorda is known for its world class fishing. You can head out into the bays, onto the beach, or just hang out at the Dunes and fish the lagoon. Just remember, fishing in the lagoon is catch and release only. Visit the Matagorda Chamber of Commerce for information on local fishing guides. You don’t have to go all the way to West Texas to see the stars. March through September is the best time of year to view the stars and views are spectacular on Matagorda Beach. You can go down beach for an even darker view, but the views are great from your deck right here at the Dunes.